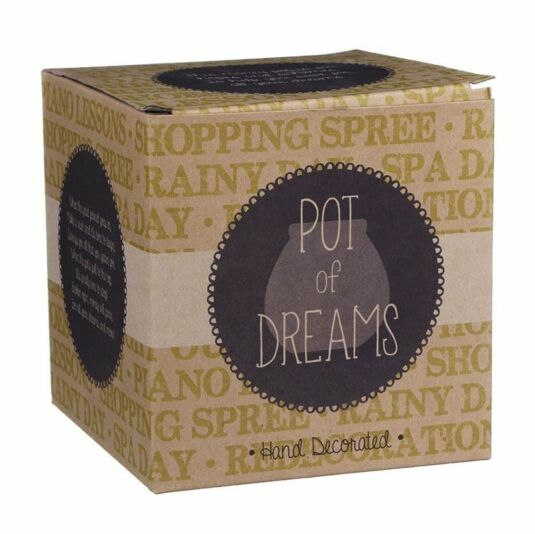 Like Pot of Dreams? Click here to view the entire range. We all know weddings can be expensive, and sometimes you don't always think about that little things that are needed until the last minute. 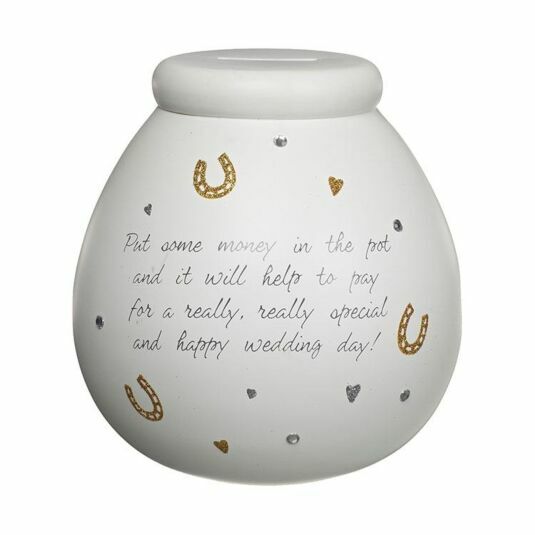 This pot of dreams money pot offers the perfect way to save for those additional expenses, and whether you choose to start saving from the day you get engaged, or wait until you have set the date, you'll be suprised how much you save. The pot comes boxed making it the perfect gift for a friend or loved one, or even as a treat for yourself if you need a little encouragement to save for something special. Made from ceramic, each Pot of Dreams money pot is hand decorated featuring fun designs often finished with glitter and diamantes. The pots come with a wide slot in the top big enough to fit both coins and notes in, but unlike most piggy banks or money pots, it does not have a hole at the bottom to retrieve your saved stash meaning you have to break into the pot to get access to the money – giving you more of a reason to keep saving until its full. A standard sized Pot of Dreams can hold over a thousand pounds in two pound coins, so whether it's for a holiday, special occasion, or just a rainy day the Pot of Dreams has real saving potential and if you’ve never been any good at saving and always find yourself dipping into the pot towards the end of the month, this money pot could help you achieve what you always thought impossible. Whether you choose to smash open the money pot to gain access to your pennies, or attempt to carefully ease open the top (which is possible) so that you can re-use the pot as a decorative piece, we hope you have fun spending the hard earned, and well saved contents. Please note that due to the nature of the product, and each being hand decorated the colours and designs may vary slightly from that shown in the image. Please take care when breaking into your pot.